Due to the latest Wallace & Grommit film, rather too many people went out and bought vast-size rabbits. Clearly in some cases this was a very bad idea. There are therefore a number of these poor rabbits now looking for permanent, kind and loving homes. They are based in Sheppey in Kent and have 24 rabbits at present for re-homing. 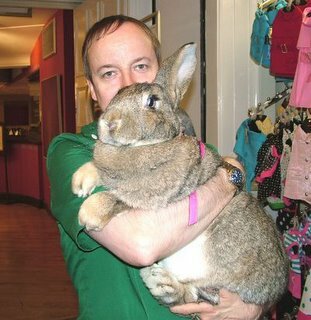 What a strange world when people give away unwanted rabbits - eat them. The size of these beasts is enough to provide three family sized stews. I've got some carrots and onions, anyone got a large casserole? The one in the photo is actuall called "gas mark six".. wonder why!? Reminds me of chucking out time at The Royal.